With international standards we engaged in tourism services mainly in diving, island hopping, snorkeling, fishing, boat and yacht rental, aqua sports, original snorkel plus, City tour, PADI courses and other marine activities. In the year 2013 added is the whale sharks encounter and Sumilon island packages. 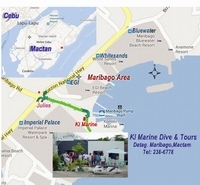 With its success managed by an experienced Japanese national, on early 90’s we were offered by one of the 5 star resort hotel here in Mactan as Concessionaire to facilitate their guests island hopping, snorkeling and fishing activities.